Artists hear it all the time: it’s not good enough to be an artist in your own context. Successful artists make work in big cities. Very successful artists make work in New York, London, Paris, Berlin. Success is defined by how international the work is. Success is rarely defined by how local the work is, and especially not associated with mid- to small-sized Canadian cities, like, say, Ottawa. Don’t get me wrong. International renown can be a great thing. Artists learning and working in other places is a wonderful way to share inspiration and knowledge across communities. But the majority of our artists migrating to big city centers? Not a good thing. 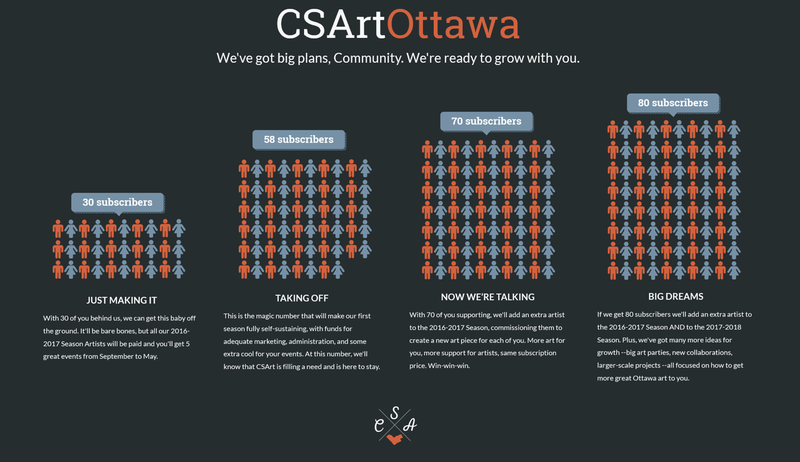 This is where CSArt Ottawa comes in. We don’t claim to be able to solve this problem ourselves, and certainly we know we won’t do it overnight. But we’re here to contribute to the growing local movement. We’re here to shine a spotlight on Ottawa’s best local artists of all different disciplines. And so far, Ottawa is with us. Our Indiegogo campaign closed at 103% funded, providing us with the start-up funds we need. This spring we were featured on Daytime Ottawa, CBC Ottawa Morning, Metro Ottawa, CKCU Friday Special Blend, and the Just Another Gala podcast. And, we’ve had our first 11 subscribers show their support and come on board. It is so encouraging to see this response to a new initiative only 2 months after launching. Now we need to find the rest of our subscribers. From now until the end of September, subscriptions are available through our website and in-person at various Ottawa art and food shows –follow us on Facebook and Twitter to stay up to date. Our minimum goal is 30 subscribers. Our sweet spot is 58 subscribers, making us fully self-sustaining. And our max for the first season is 80 subscribers. Be a part of building our local scene and helping artists find their success here, in Ottawa. We’d love to have you on board.